- The Devil’s Due is a quest exclusive to the Museum of Witchcraft. The Museum located on the far northeastern edge of the Commonwealth, a short trip southwest of the town of Salem. You’ll find it on the coast. 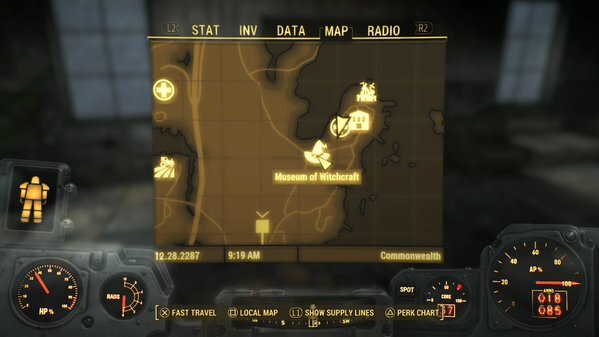 You may find the Museum through sheer wandering, but it’s more likely to pop up on your map while wandering around Diamond City, as NPCs will occasionally mention it in conversation. - The front door of the Museum of Witchcraft is chained shut, which should spark some alarm bells. It gets even stranger if you move to the right side of the Museum, where you’ll find the body of one Private Hart, butchered and left beside a tree. Pick up Private Hart’s Holotape to trigger the quest, then listen to it for some clues. Check the base of the Museum near the tree after listening to the Holotape to find cellar doors leading into the Museum’s basement. - There’s something big above your head down here, but you can’t see it yet. Make your way through the basement’s small rooms - you can find a Vault-Tec Lunchbox under a table surrounded by folding chairs - until you find a set of stairs leading up one floor. Nothing will attack you, so don’t stress out too much. Yep, you probably guessed what caused all the trouble. This Deathclaw battle is like any other, though it’s tougher than the average creature, and you’re cursed with some crappy terrain. The enclosed nature of the Museum makes it easy for the Deathclaw to quickly close in and pin you. Fortunately, you have one major advantage, which is the door you used to get in here. The Deathclaw can’t follow you through, and will retreat back into the Museum. If you have trouble, return to this door, wait for it to wander away, and then shoot at it a few times. If all else fails, retreat through the basement and come back later! - Kill the Deathclaw and you can access the north side of the Museum, where you’ll find a steamer trunk full of goodies, along with a bunch of Gunner bodies. Check the bathroom near the entrance and you’ll find Sergeant Lee’s Holotape, which fully explains what happened here. Near the Holotape is a Pristine Deathclaw Egg; grab this and leave. First, you can complete delivery of the Egg. The would-be owner is Wellingham, a Mister Handy unit who works at the Colonial Taphouse in Diamond City. Take the Egg to him and he’ll give you Wellingham’s Recipe, which unlocks several Deathclaw-related items at Cooking Stations. He’ll also give you 200 Bottlecaps - or more, if you’re persuasive enough. Second, you can return the Egg to its nest. Finding the Egg will make a new location appear on your map. The Deathclaw’s nest is located a ways northwest of Salem, on the very edge of the Commonwealth, amid some very rocky terrain. Another Deathclaw is sitting by the nest, but it won’t attack… unless you try to leave without giving back the Egg, anyway. You’ll find a Deathclaw Gauntlet sitting in front of the nest. Grab it after depositing the Egg to complete the quest.